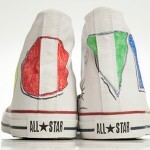 Some artists have joined other artists from across the world in customizing a pair of new Converse for charity. Sneakers customized by artists such as Bruno Mars, Christina Perri, Fun., Grouplove, Jason Mraz, Paramore, Santigold, Simple Plan, Trey Songz, Zac Brown and many more are going to be auctioned on eBay from Oct 24th – Oct 29th. 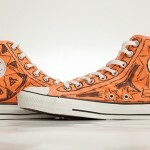 There are over 70 pairs of personally designed Converse. It took over 18 months to put together the ‘In Their Shoes initiative’. 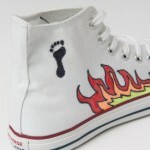 The organisation has been reaching out to artists internationally, and giving them a pair of plain white Converse sneakers & Sharpie fabric markers. The artists have then created one off pieces of art by putting their own unique stamp on the sneakers adding colour, design, humour and impressiveness. All the sneakers are hand designed and one of a kind. Be you a fan, a collector or just want some cool All Stars you can bid to win from an incredible roster of artists from around the world.